There is power in rotation. The inclined arc type motion (or typical swing plane) in a golf backswing is similar to the evolved kicking motion of field goal kickers. Left: Kickers in the mid-1900s kicked from straight on, with field goal makes traveling 40 yards. 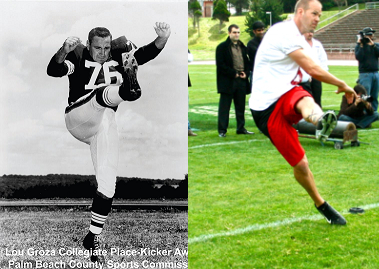 Right: Modern day kickers have a more rounded or soccer-style kick, with field goal makes traveling 60 yards. 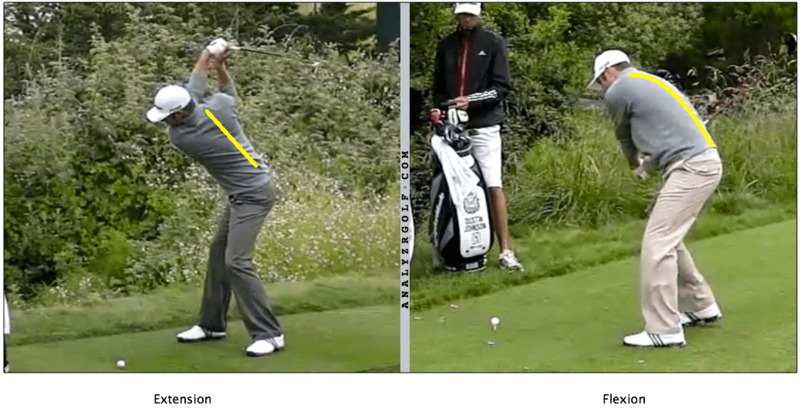 The same inclined arc type motion can be seen by the world’s best golfers. If we could only swing the club straight back and straight through, like a croquet motion, the ball would not go nearly as far. While these backswings below have their differences, all of the golfers have moved the club “inward” while turning to create rotational power. To envision this, simply draw a line straight downwards from their hands at the top of the backswing. You’ll see the club has moved quite a bit inward from the target line, where it started at address. Lay an alignment stick down just on the outside of the ball so it extends very closely along the target line. During the first couple feet of the backswing, you’ll want your body turning so the sweet-spot of the club moves progressively away from the alignment stick. 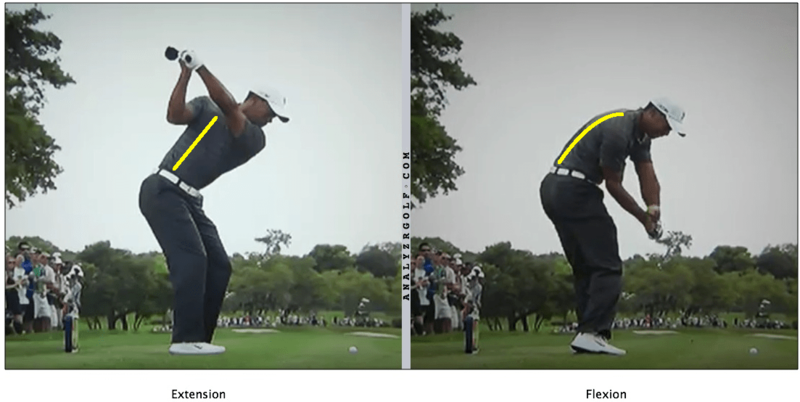 The motion may feel like the club is moving progressively “in (away from the target line) and up”. Along with rotation, there are various types of leverage utilization that occur in the golf swing and in a kicking motion. One in particular has to do with the extending and flexing of the spine. While this may sound complicated at first, it is visually apparent, a natural biomechanics move found in many sports and is useful for loading and unloading power. Note how before the strike, Gostkowski’s spine is extended (the number 3 on his jersey is stretched out) and afterwards his spine is in flexion (the number 3 on his jersey is scrunched together). The motion is similar to the motion a wood chopper would use with an axe as he raises the axe above his head (extends) and then drives the ax downwards (flexes). 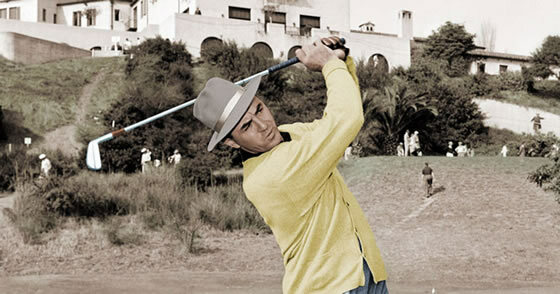 While the golf swing has more components to it, there is an apparent extending (backswing) – flexing (transition) – extending (from the down swing into the follow-through) motion that the best golfers tend to exhibit. Different golfers will do these motions at different rates and sequences, but overall, extending and flexing are important aspects for both control and distance. Stand with your arms crossed with your hands on opposite shoulders. As you imitate a backswing, feel as though the buttons on your shirt start to point up to the sky. During the transition and near impact they will return to pointing down at the ground. Then, in the follow through point the buttons more up towards the sky again. This may feel like an exaggeration but will give you the idea of what extending and flexing feels like in the golf swing. With the modern technology available to measure the movement and planes of motion, it is apparent there are certain positions more useful than others when it comes to a striking motion. If we take a look at these kickers and golfers, because the “downstroke” motion is an arc, you’ll notice they exhibit side bend (since their spine is inclined towards the ground while turning). Therefore their shoulders point more towards the ground than anywhere else. Not so ironically, the ground is also where the ball is located. Here are a few examples of how the following drill will look. As you can detect from the pictures, this type of finish can positively help a golfer make more consistent contact, and can help control their swing path as well. Take some practice swings and finish with your trail shoulder lower than your lead shoulder. You may also feel as though you’re listening more towards the ground with your trail ear. This entry was posted in General Golf Learning, Golf Swing. Bookmark the permalink. Just awesome! Excellently written. Great information for every golfer!